Okay, so the last few weeks and months, I’ve been devoting more of my time to spiritual training & raising my consciousness & awareness. Telekinesis training has been very minimal and the only TK training I’ve been doing, has been passive training, while doing other everyday tasks. Today I was training with the psi wheel. 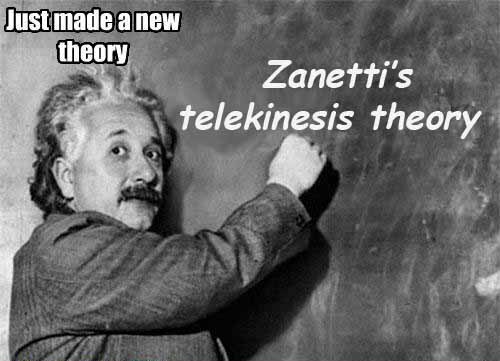 During my training session, I was deep in thought, and a new theory came to me. It is not so much a new theory in the world of science, but it was new for me, in that I really REALLY believed it was true for the first time today. So, seeing as I was training with the psi wheel, I decided to put the theory to the test. Indeed, the theory does seem to hold some weight, and the psi wheel responded well to my new approach. This theory that I speak of is very similar to the Zero Point Energy theory that is gaining more popularity among open-minded (quantum) scientists these days. When an object moves via mind power, the object has to draw from some kind of energy source. It needs energy to move. That, we can all agree is a natural law of the Universe. So the question arises … where does this energy come from. My theory is that the object is not using energy from our mind, but it is drawing energy from the surrounding environment (the air or the ‘ether’). If you like, this energy field is the same energy field as The Force in the Star Wars movies. To move objects, Luke doesn’t use his mind (although that is an essential component). Luke uses The Force to cause an object to move. This same energy (Force) is what I think I’m using in my own telekinesis training, only I didn’t realize it fully up until now. I really don’t know if telekinesis does work or even exist. However so many people are training for it. Somthing I have been thinking about was, alternating the currents between your left and right hemisphere. It actually does work You can feel the flow of energy through the brain. If you get it right you can sort of re activate the parts that fill empety… pardon the pun. But anyway another Idea I have noticed is trying to control how a computer works, speed up or slow down the browsing speed of you computer, just like you exhale a breath, exhale your thought into the computer. With the primary notion of either slowing it down or speeding it up. Like the root of an exponent the x is the energy and the, ^2 or ^-2 (x^2) can’t really the the x squared thing off memory, Is the intent to speed or slow it down. The energy is there, and if the will is there too you have an effect from thought. Keep training my friend. Patience. It could take many years of training before you achieve it. hey i,ve been traning or about 8 years since i was 10 but in those 10 years i had to stop for like a year or so and i cant seem to get back to the levle i was once at any suggestions is highly appreciated good luck on levitation training. Thank you my friend. Training for 8 years already? That’s a long time. What kind of level were you at? I mean what kind of abilities did you have, and how strong were you? Also, I’m interested in what kind of training you were doing.